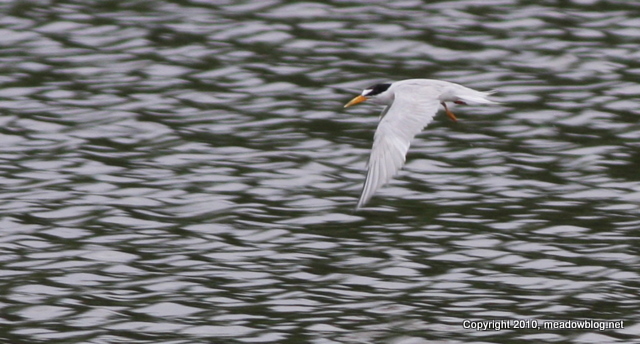 We saw three Least Terns yesterday afternoon over one of the impoundments at Harrier, and another was seen near the entrance to the Saw Mill Creek Trail earlier in the day. 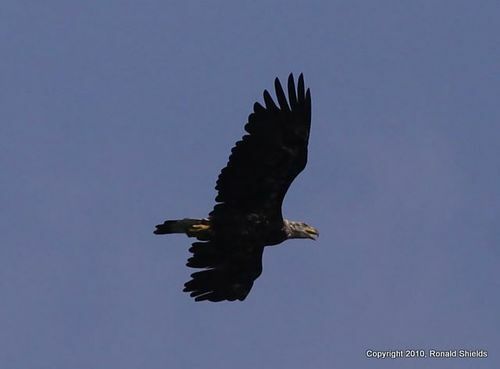 For the past week or so, we have been getting reports of one or more Bald Eagles hanging out at the Keegan Landfill in Kearny. Alas, we have not had the opportunity to get dwon to the landfill and see for ourselves. 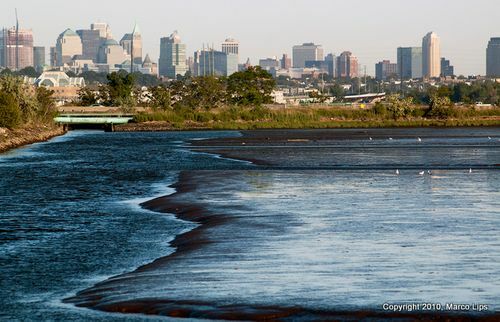 Fortunately, Ron Shields took a few shots from his kayak in the Kearny Marsh. 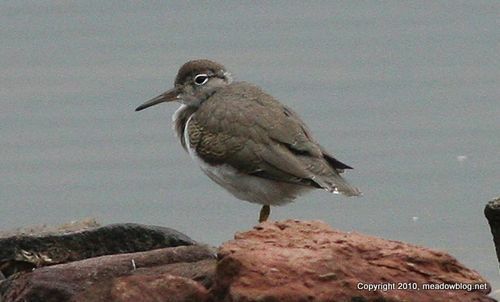 He writes that the two shots were taken roughly 30 minutes apart, but that he thinks the photos are of the same bird. 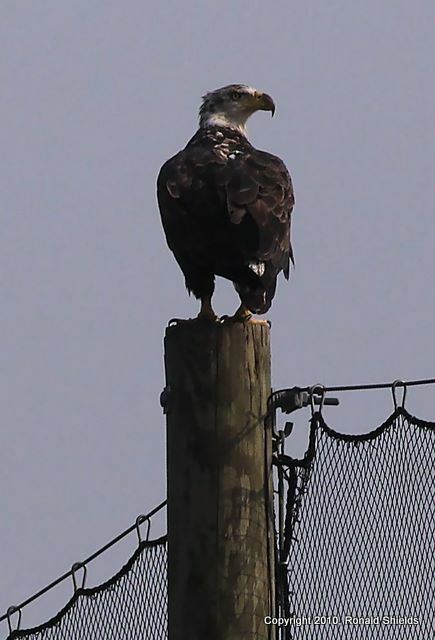 We do get Bald Eagle sightings at DeKorte from time to time, including this one from March, when Bald Eagles and gulls were competing for fish. They are always awesome to see in the wild. Nesting Cliff Swallows at DeKorte! The NJMC's Jim Wright wrote this nature column about nesting Cliff Swallows for the current editions of The South Bergenite. 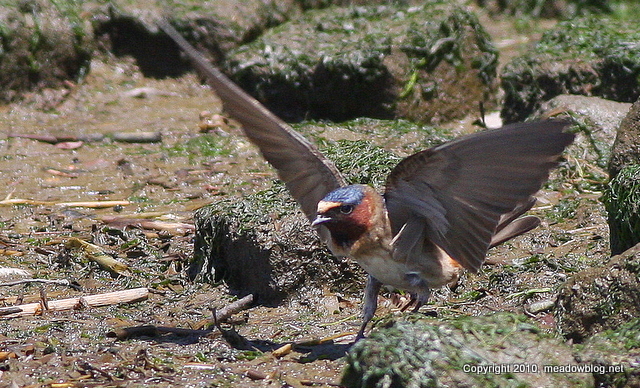 Ever since the New Jersey Meadowlands Commission began a nesting-box program more than a decade ago, DeKorte Park has been an attractive neighborhood for hundreds upon hundreds of Tree Swallows, those fast-flying iridescent-blue marvels that zip back and forth across the open water in search of insects. This year, we have had a new type of swallow for a tenant – nesting Cliff Swallows. 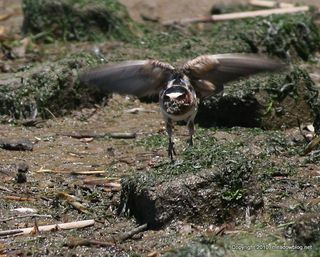 But these birds aren't taking up residence in the wooden nest boxes — they've made their own mud-walled homes under the Meadowlands Environmental Center’s Marshview Pavilion. The Record had a great article earlier this month about Marco Lips, the artist currently exhibiting in the Flyway Gallery in DeKorte Park's Meadowlands Environment Center. Link is here. Another nifty story appeared in The Observer. Link is here. The exhibit runs through the end of August. A link to Lips' website is here.